Straight-hair nevus (SHN) has been defined as a delimitated area with straight hair locks surrounded by curly hairs. In the few cases that have been reported, the condition is mainly linked to a local keratinization disorder: ichthyosis or epidermal nevus., It has also been reported in a patient with straight hair associated with local epidermal defects. No genetic changes have been referred. We report an 8-year-old girl whose parents sought medical attention because of plaques of fine and straight hair over areas of yellowish flat scalp [Figure 1]. Her normal hair was also straight and with normal thickness. She presented these findings from an early age and also had a history of pneumonia, chronic constipation, and multiple pilomatrixomas. Optical light microscopy did not show any change or dysplasia in normal and affected hair samples. 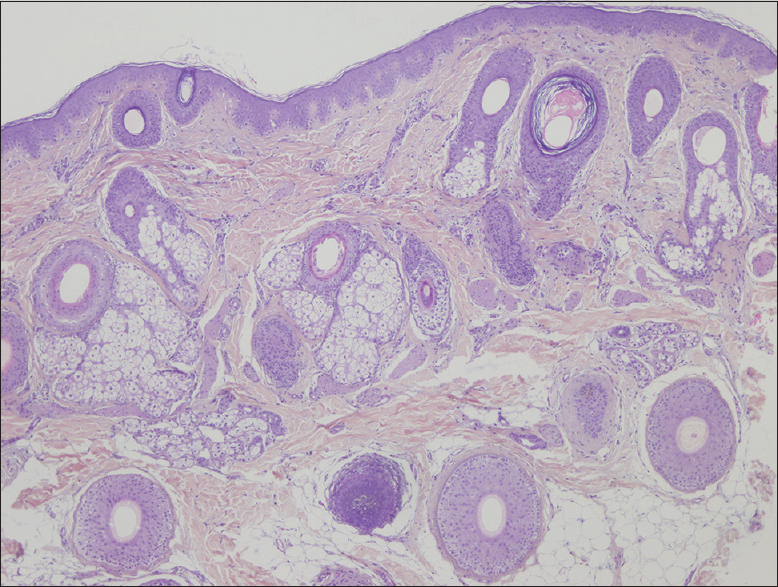 The scalp biopsy showed normal skin but hyperplasic sebaceous glands [Figure 2]. Scanning electron microscopy showed fine canaliform hairs without cuticular alterations, and X-ray microanalysis presented a normal spectrum. SHN is the opposite of the woolly hair nevus; that is to say: the presence of a lock of erect hairs in a curly hair pattern., In SHN, the affected hairs usually have a reduced diameter, approximately half that of normal hair, with small and disorganized cuticular cells., There has also been reported a unilateral SHN in a child with congenital Horner's syndrome caused by a tumor in the stellate ganglion and also in AIDS patients with both localized and diffuse form of SHN. The biopsies taken in these patients showed a lymphohistiocytic infiltrate and fibrosis around the upper and mid follicle. In conclusion, the SHN has always been described associated with underlying skin changes of the scalp or to inflammatory or tumor conditions  regardless to race (negroid, Caucasian, or Asian hair). Hence, does the straight hair nevus exist as an isolated condition or is a result of a previous underlying inflammatory or tumoral condition? Our patient is an appropriate example of the presence of some bands of locks of fine straight hairs over a sebaceous nevus in a pattern of straight hair. Another plausible hypothesis is that we are facing two cell clones, epidermal and follicular, which give rise to a different cutaneous and follicular expressivity. Gibbs RC, Berger RA. The straight-hair nevus. Int J Dermatol 1970;9:47-50. Day TL. Straight-hair nevus, ichthyosis hystrix, leukokeratosis of the tongue. Arch Dermatol 1967;96:606. 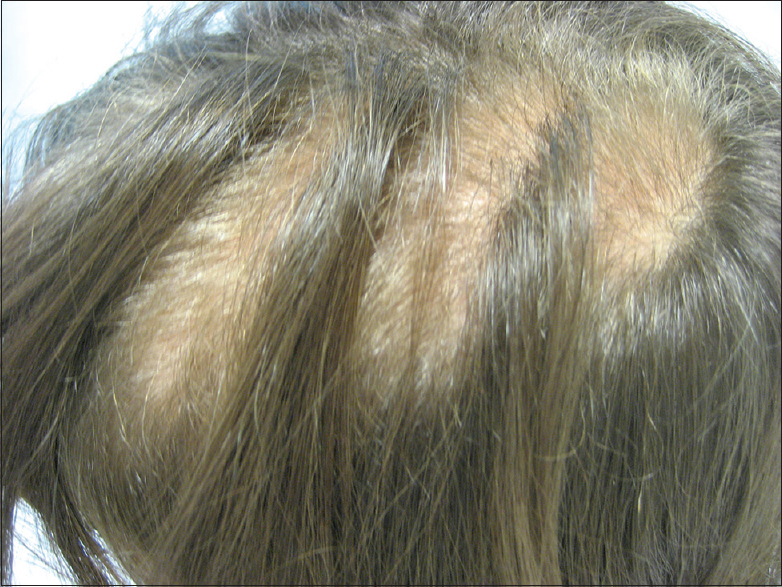 Lange Wantzin G, Poulsen T, Thomsen K. Straight-hair nevus in a patient with straight hair. Acta Derm Venereol 1983;63:570-1. Downham TF 2nd, Chapel TA, Lupulescu AP. Straight-hair nevus syndrome: A case report with scanning electron microscopic findings of hair morphology. Int J Dermatol 1976;15:438-43. Ferrando J, Grimalt R. Pediatric Hair Disorders. 3rd ed. Boca Raton: CRC Press Taylor & Francis; 2017. p. 29. Whiting DA. Hair shaft defects. In: Olsen EA, editor. Disorders of Hair Growth: Diagnosis and Treatment. New York: McGraw-Hill Inc.; 1994. p. 91-137.